You want to analyze the performance of your Twitter account, but don’t want to spend three hours doing it. You’re not alone. A Twitter audit isn’t at the top of most marketers’ list of fun things to do for the day. But it has to be done. Luckily there’s no rule that says a Twitter audit has to be excruciating or can’t be done in under an hour. If you’re efficient and organized, you can run a successful Twitter audit with all of the data you need in as little as 20 minutes. What Is a Twitter Audit? A Twitter audit is a diagnosis of your Twitter account’s performance. During a Twitter audit, you want to look at your Tweets, followers and the overall branding of your account. The goal is to find any weaknesses or holes in your account, and potential opportunities for improvement. For social media marketers, a lot of focus gets put on growing your account, getting more followers on Twitter and increasing traffic. But unless you’re taking a second to audit everything you’re doing, it’s difficult to gauge whether or not you’re making the right decisions. So the question is where do you start? Here’s how to perform a complete Twitter audit in less time than it takes to have a pizza delivered. Auditing your profile and branding. We’ll start by auditing your Tweets. Keep in mind that you can customize the process to fit your needs. The first thing you need to do is get your data together. If you’re gathering data from multiple tools, you’ll want to combine it all into a single document. For this guide, we’ll show you how to get the data for your audit from Twitter’s native platform and Sprout’s Twitter analytics. Log into your dashboard and select the Tweets tab. Twitter will give you a spreadsheet with details like engagement, stats for your promoted Tweets and more. If you have multiple Twitter profiles, you need to do this process for each account then combine everything into a single spreadsheet. The second option is to use Sprout Social. One of the biggest benefits of using Sprout is you can access data for all your profiles in an instant. This prevents you from having to export reports for each profile one by one. Sprout also allows you to put everything into one spreadsheet. Open your Sprout Social dashboard and navigate to the reports tab. 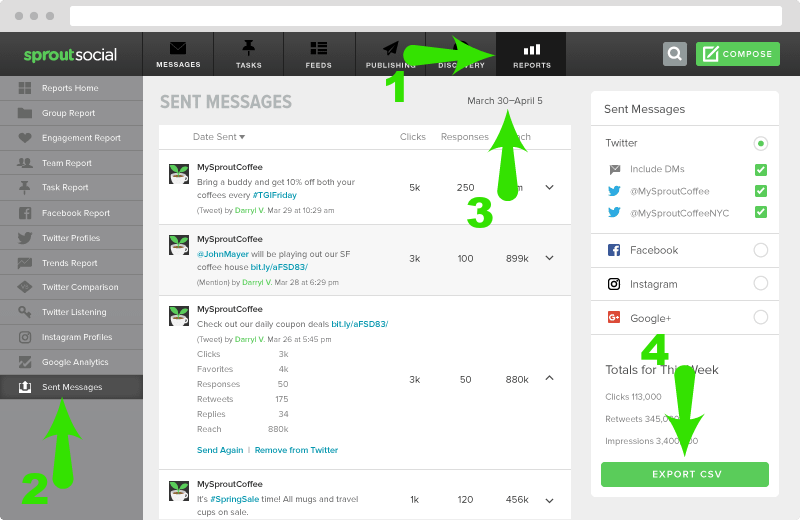 Click on your Sent Messages report to see data on a Tweet level. Select the time frame (the larger the window the more data to analyze). Select the Twitter profile you’d like information on and Export CSV. Sprout’s reports are ideal for companies that have multiple people managing their Twitter marketing. Your report shows who sent each Tweet, which makes it easy to track and measure individual performance. Now you have a bunch of data to go through. But before you do a deep dive, you need to know what you’re looking for. So you need to define your goals for the audit. Then match those goals to metrics you can track. Likes are a way for Twitter users to show they appreciate your post. Some may think of Likes as a vanity metric, but they’re an indicator that someone enjoys the content you’re sharing. Retweets are similar to Likes in that they show someone enjoys your content, except they are a little stronger of a signal. A Retweet means a person enjoyed your post so much they decided to share it with their own followers. Replies are messages people send to you in response to one of your specific Tweets. These can be positive, negative and neutral, so make sure you’re looking at the sentiment of replies instead of just the quantity. Clicks count as when someone clicks on a link that you Tweeted. This is typically one of the top metrics for social media marketers, since driving traffic is one of your top goals. In addition to engagement, some brands like to measure reach or impressions. 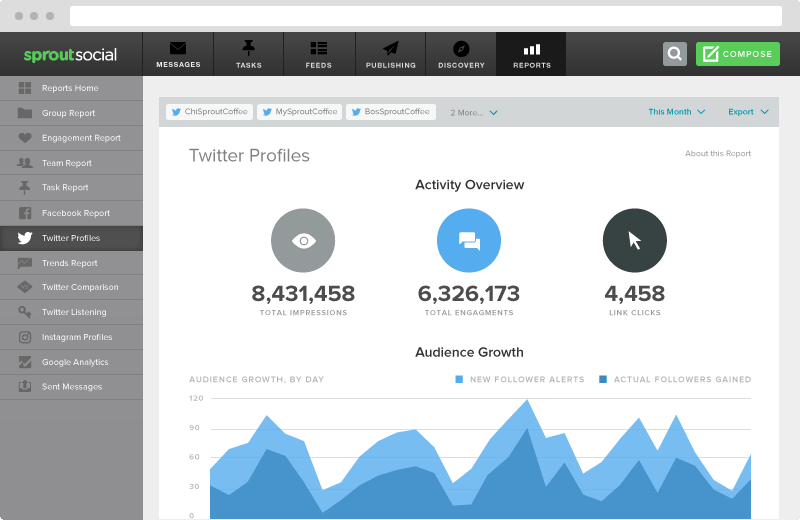 Reach is all about how visible your Tweets are. As Twitter users share your messages with their own audiences, it will be seen by even more people. This leads to an increase in your overall reach, or the amount of people who have seen one of your messages. This metric is important for marketers focusing on branding and awareness. All of these metrics are meant to help you determine which Tweets perform the best so you can share more of the content your audience resonates with. Without doing a Twitter audit, it’s difficult to pinpoint Tweets or content that works best for your audience. Taking time to review your Tweets on an ongoing basis will give you a lot of great insights. We have the data and we know what we’re looking for. The next step is to review it all in your spreadsheet. Keep your goals in mind when you’re looking through your reports. It’s best to sort your data based on your goals. For instance, if you want to increase your Twitter referral traffic, organize your spreadsheet by Tweets with the most clicks. Then you can see exactly which are your top performers. The type of Tweets: Pics, videos, links etc. Copy: Are you asking questions? Or maybe there’s a particular sentence structure that works well. Hashtags: What hashtags are you using, and how many? Mentions: Do your top Tweets mention influencers or specific accounts? It’s easy to fall into the trap of analysis paralysis while doing a Twitter audit. Particularly if you’re sorting through hundreds or even thousands of Tweets. By defining what you want to look for before you start looking through spreadsheets, you’ll be able to streamline the audit. Knowing who’s following you will help you produce content that’s more tailored toward your audience. Sometimes when your Tweets aren’t getting as much engagement as you’d like, it’s because there’s a disconnect between what you’re sharing and what your audience wants to see. The first step in fixing that problem is analyzing who’s following you. We wrote an in depth guide on how to analyze your Twitter followers. We highly suggest reading that post to help with your Twitter audit. But we’ll break down some of the key points here and a few extra things to consider. How many fake followers you have. What your followers Tweet about. When your followers are most active. Luckily you can get all of this data using just a couple of tools. To find your fake followers, you can use a tool like this. It’ll give you an estimate of how many bots are following you. If you end up having a ton of fakes, read our guide on getting genuine followers. You can use Sprout to get the rest of the data. 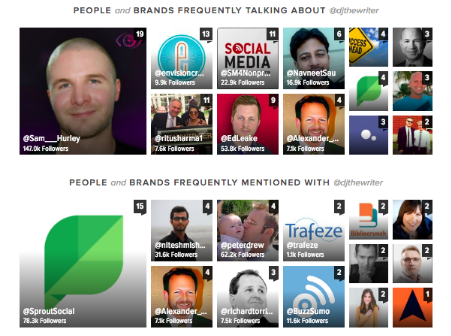 For instance, our Trends report shows your top brand advocates on Twitter. 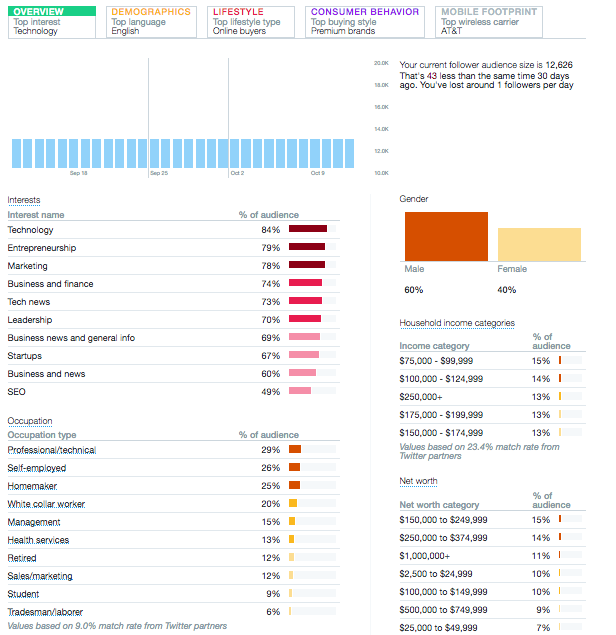 You can also see your audience demographics in our Twitter Profiles report so you know who’s following you. Put all of this information into a spreadsheet and develop a profile for your average follower. You can be as detailed as you’d like, but just make sure you’re only including useful information. If it won’t help you improve your Twitter strategy, you can leave it out. 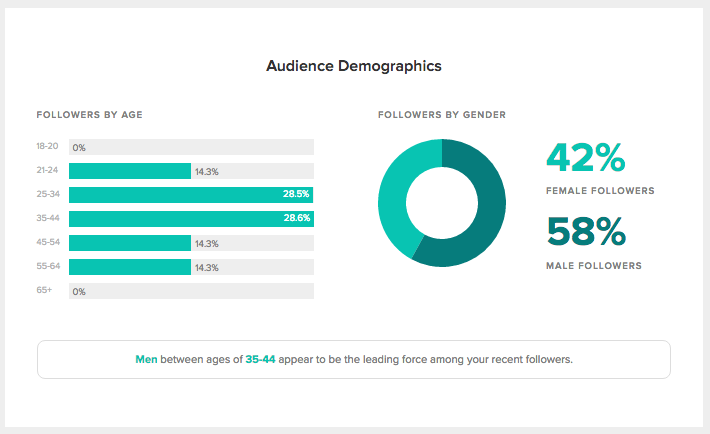 Use Twitter’s native analytics to get even more demographics about your audience. List of your top brand advocates and influencers following you. Last but not least, you need to audit your Twitter profiles. That includes things like checking your bio, URL and even profile picture. Your Twitter profile shouldn’t be the same as it was five years ago. As your brand grows and changes, you should update your Twitter profile to reflect that. Start by making sure all your profile graphics are correctly sized because Twitter occasionally changes its image dimensions. If you go years without ever touching your profile, there’s a chance your current header or profile picture needs to be updated. Even if the sizing is correct, the image itself might need a refresh. Check our social media images size guide for the current sizing. Next, look at your Twitter profile link. While most brands link to their home page, others like to use the space to link to a particular campaign or social media contest. If you were using your Twitter profile link to push traffic to a contest that already ended or other old content, this is the perfect time to change it. The worst thing you could do is link to a page that’s outdated or irrelevant. Does my bio represent my brand? Is it clear what my company does? Does my bio compel people to take action? Twitter bios are often an underutilized part of Twitter profiles. One of the first things people see when they find you on Twitter is your bio, so make sure to create a great first impression. 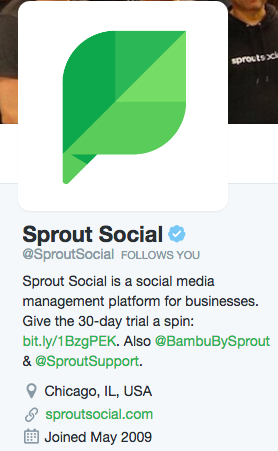 Notice how our bio clearly describes what is Sprout Social, and even includes a strong CTA for a free trial. You could even try testing out different bios and measure the success of each variation. Use a trackable URL like the Bitly link in our bio above in order to measure your traffic. This quick and simple process will allow you to do a Twitter audit that gives you valuable data without spending hours of your day creating and analyzing reports. The goal of a Twitter audit isn’t just to gather a bunch of data that sits around on your computer for months. It’s to help you spot new opportunities and improve your strategy. Turn your audit into actionable steps you can take to grow you audience and get more from Twitter.